I've been reporting on EVs now for 20 years. 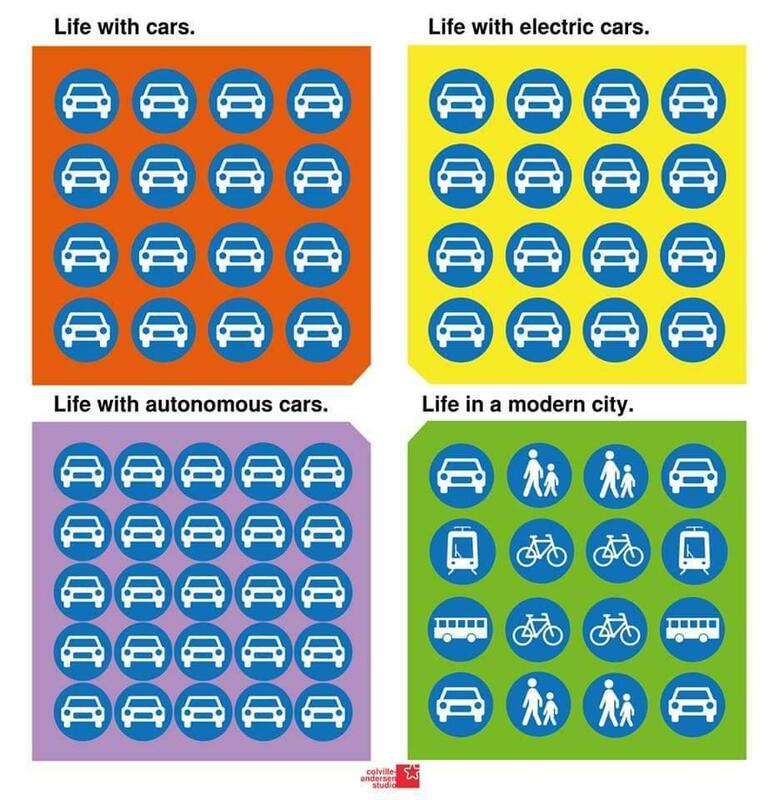 You might say I am a proponent of clean car technology, but I am also a advocate for smarter streets, so when I came across the following graphic, I knew I had to share it because is really illustrates the divergent pathways now confronting us: do we simply swap ICE for EV or do we think more boldly about the future and consider the consequence, intended and otherwise of transitioning from private vehicles propelled by internal combustion engines (ICE) to privately-owned electric cars and someday autonomous EVs. There are an estimated 750,000 plug-in automobiles in the United States and as many as 1.5 million worldwide, and growing rapidly at an accelerating rate. We are, as the graphic suggests, moving steadily from the red box to the yellow one: swapping gasoline (petrol) for electricity. At the same time, (thankfully,in my view) more global and regional governments are proposing bans on the sale of ICE-age cars by as early 2030: British Columbia in Canada just proposed such a move. Several European countries preceded the province. I would guess Quebec will soon follow suit. Similarly, more and more cities are either limiting or banning access by ICE vehicles to their urban cores. I just learned that here in Omaha, one of our major downtown thoroughfares - Farnam Street - will become a pedestrian-only promenade in the next couple years as the Great Plains city on the banks of the Muddy Mo and whose Chamber of Commerce proudly boasts, "We don't coast," moves to become less car-dependent and more people-friendly. I recently had coffee with Omaha's now-retired but still consulting Planning Director. Like the creators of the graphic, he too expressed his concerns that autonomous cars (EV or otherwise) would only lead to more gridlock, which is why he's a advocate for a rebirth of the city's trolley system, though scaled down from its early 20th century predecessor, one that would encourage greater population density along the proposed east-west corridor. As he pointed out, successful public transit depends on density: more people per square mile. But it also depends on transportation choice and convenience, as the 'Life in a modern city' box points out. That's pedestrian sidewalks and safe, segregated biking lanes; fast, efficient, affordable public transit and on-demand personal vehicles from bike- and scooter-share to Lyft and Uber and Maven and Zipcar; followed by autonomous shuttles and pods. Its encouraging to see communities, be it Seville in Spain or Omaha on the Great Plains, taking steps that move their cities and citizens towards the green box and not just the yellow or the purple. I love EVs, but I love the idea of a less car-dependent way of life even more. Now, if you'll excuse, I have to hop on my electric bike and ride to the store for some eggs and, hopefully, dates with which to make my annual holiday-season fruitcake.